Welcome to the third lesson of this special course! 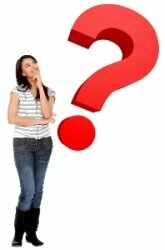 What Are the 2 Most Important Questions You Must Ask Yourself Before You Say or Write a Sentence? These 2 questions are important because they will help you decide which tense you should use. 1) What is the time of the action? 2) What aspect of the action do I want to emphasize? Do I Want to Emphasize? do you want to emphasize the fact that the action is in progress (ongoing)? Or the fact that the action is complete (finished)? Or maybe you don't want to emphasize anything? Lisa is at the bank. She waits for service. She waits and waits and waits, but nothing happens. Now, after all this waiting she wants to complain about it. What time should she use? PRESENT, because it's happening NOW. She wants to emphasize the fact that this action is now in progress, it still continues, so she uses the PROGRESSIVE aspect. So Lisa says: "I am still waiting! What is going on?" Lisa talks with some friends. They ask her about her life. She wants to tell them that she left her job a week ago. What time should she use? PAST, because it happened a week ago. She just wants to mention what she did. She doesn't want to emphasize any particular aspect, so she uses the SIMPLE past form of the verb. Lisa says: "I left my job a week ago." These two rules are applied by English speakers all the time. Obviously, they don't pause every time they want to say something... It is done naturally, without thinking about it. He is preparing for his exam. She is not working today. Things that happened in the past are expressed using the Simple Past tense. She started school in 1991. They bought the house a year ago. We wanted to go to the party last night. I was washing the dishes all evening. She was sleeping all night. They were working when the power went off. I have lost my wallet. Now what am I going to do? She has watched that movie. She doesn't want to watch it again. You have studied for this exam, so you should do fine. I will be 21 next week. She will not tell you. I am going to start a business. He is going to talk with his father about this. They are not going to listen. This is a partial list of the most common tenses usage. Don't worry if you don't remember all of it. This is just a short overview. We will go over all these tenses in detail in the following lessons! So now, after all of this information, let's do some exercises! On the next lesson we will dive right into learning 3 of the most common tenses of the English language.